Interview with Dani deWaal: Sophie Sheridan in Mamma Mia! Dani de Waal was born in Bavaria, Germany to a South African father and a British mother. When she was five, her family moved to England. Dani went to The Arts Educational School, Tring Park where she studied musical theatre and graduated in 2007. She then went on to train at Guildhall School of Music & Drama, where she concentrated on acting. In 2008, Dani won the ‘VOICE National Performing Arts Competition’ in Yeovil and the ‘Trinity Arts Musical Festival Competition’ in Camarthen, Wales which was judged by John Owen Jones. I don’t think I can really remember a time when I didn’t want to be a singer/actress. I moved from Germany when I was five and started singing, piano and local dance lessons pretty much straight away and I went to a Saturday acting school. But I guess that it is quite common among many young girls. I think when I went to boarding school at 11, The Arts Educational School, Tring Park (now Tring Park School for the Performing Arts) I knew I didn’t just want this as a hobby; I had my sights set on making it my career. Do you know, I’ve never really thought about this before, but I would probably have to say my Grandad! Obviously there are many, many actors that I’ve come across over the years whose work has inspired me, but as a little girl, it was going to see him in his ‘am-dram’ that gave me that itch to get up there and join him. I remember listening to Linda Eder for hours on end, she has the most amazing tone to her voice. Sutton Foster, Kerry Ellis, Eden Espinosa, Shoshana Bean – all people who have led me to hours on end sat in front of ‘YouTube’. I have incredible admiration for Bernadette Peters, obviously her voice is immense, but it’s her acting and the intensity and emotion which she delivers through her songs that make her very special for me. I totally believe acting to be the priority, even in musical theatre. You trained at Guildhall School of Music & Drama. Please tell us about your time there. At the Arts Educational School I was on the Musical Theatre course, which I absolutely loved, but where the focus was definitely on the singing and dancing. I decided I wanted to go and train in straight acting after school because it was the area I felt least confident in. I studied a three year, full-time BA (Hons) in Acting degree at Guildhall, and my time there was probably the best few years of my life. My eyes were opened up to so many different kinds of theatre which I had never even considered before. The teaching staff there were incredible, and I made some friends for life. It certainly wasn’t a walk in the park, there were many ups and downs; discoveries I made about myself as a person not just on the stage. Would I want to do it again now? No. Would I change it for the world? No. When you were 18 years old, you won the ‘Trinity Arts Festival Musical Theatre Competition’ – what an achievement! One of the judges was John Owen Jones. Please share with us what this experience was like for you. My sister had entered the competition the year before and had really enjoyed it; she also won that year. So I decided I would go for it the following year. It was held in Camarthen, Wales, and we drove there as a family on the morning of the competition. It was held in a beautiful church at the Trinity College. The prelims were in the morning for which we had to prepare two songs, and then the final was later that afternoon, for which we had to have three more songs. I was really surprised to win as everyone in the final was of a really high standard, but I was thrilled. It was also great to have personal feedback from such industry professionals. Your sister Jeanna de Waal is also a singer and actress, currently living and working in New York. So does the acting/singing bug run in the family? Well like I said my Grandad (on my mum’s side) has been into amateur dramatics most of his life, and I know my mum was on the stage too when she was younger, but never professionally. As for my Dad he is a dentist, and (sorry pops) verging on tone-deaf! I love that Jeanna and I are in the same industry. It’s great to have someone as close and as honest (as only a sister can be!) to talk to and learn from. She is so supportive of me, and I really look up to her. 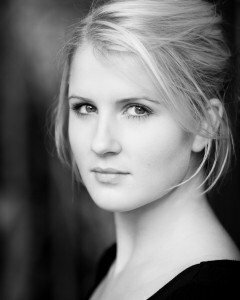 You are currently playing Sophie Sheridan in Mamma Mia! at the Prince of Wales Theatre. How would you describe Sophie – what’s she like? Can you identify with her? Sophie Sheridan is a head-strong, adventurous dreamer. If she puts her mind to something, she’ll get it. She is daring and fun, but her impulsiveness can lead to her not always realising how her decisions may affect others, and what the full consequences of her actions will be. She has been brought up on her own by her single mother Donna, so they have a very close relationship. There are lots of these traits I can identify with, particularly her unyielding determination to get something she wants. Although I think Sophie may be a little more ‘ballsy’ than me. Why should someone who loves the film (and has got the DVD) go and see the musical? What makes the show a special experience? The show was in fact around before the film and subsequently the film was directed and produced by the same people as the original stage production, Phyllida Lloyd and Judy Cramer, respectively. Therefore people who have seen and loved the film can expect to see on stage a show which remains true to what they’ve already experienced of Mamma Mia! Of course the cast all put their own little stamp on the much loved characters, and then there is the fact that it is live theatre, which in my eyes, you can’t beat. The whole theatre buzzes every night, it really is electric…and I defy anyone who says they didn’t want to get up and dance at the end! You made your West End debut in Mamma Mia! Were you nervous? I had a five week rehearsal period for Mamma Mia! which was a real luxury in comparison to how long you get on some other shows; so I felt really well prepared by the time it came to opening night. But of course I was still incredibly nervous. I think the best part would have to be that I’m doing for my job what I have always loved doing, and would be doing anyway as my hobby! I know that’s not something that everyone can say about their work. Mamma Mia! is my first professional job, and I’ve gone into it straight from drama school, so I can’t yet speak from experience, but I know a hard part of being an actress is the uncertainty of your employment. You can be a lead in a ‘West End’ show one day, and then be unemployed the next; back on the rounds and rounds of auditions with the other thousands of hopefuls. I think as an actress you also need a strong sense of self; know what you believe in, and trust in your own talent. Because you are open to such scrutiny and judgement in this industry, that your own self-belief needs to concrete, or you’ve got no chance. Actually the scariest but also funniest thing that has happened to me on stage is, dare I say it, corpsing. If you’re not familiar with the expression, it’s when you laugh at something on stage, but not as the character, just as you yourself finding something funny (very unprofessional in fact) but sometimes unavoidable! The reason I say it’s scary is because it feels so out of your control; you know that feeling, everyone’s had it, where you just can’t not laugh however much you tell yourself not to, well try having that feeling when you know your cue is coming up for you to sing on your own! The fear pretty quickly knocks the giggle out of you, but it can be touch and go for a minute. What other parts would you love to play and why? There are so many parts I would love to play. I know I need to get in line behind the thousand others, but Elphaba in Wicked has always been a dream role of mine…give it a few years though! I would also love to be involved with new writing. A dream of mine is to appear as ‘original cast’ in a new musical at the Donmar Warehouse. I would also love to do a play at the National Theatre on the Olivier Stage, because that space would just be incredible to work on. Maybe in a Chekov play, I do love a good Chekhov. If you could go see any West End musical, which one would it be and why? I am very keen to go and see GHOST The Musical actually, because I have heard great things about it and have not had the chance to see it yet. Also I am a big fan of Caissie Levy after having seen her in the musical Hair last year. Apart from starring in Mamma Mia!, you’re also part of a swing duo. Please tell us about ‘Silk Street Swing’. My ambition is really just to sustain a life-long career in this industry. I think that alone would be an achievement; there are many people wanting these jobs, and not that many of them to go around. I don’t know what paths my life may follow in the future, it’s very early days and I am completely open to anything at the moment. As long as my work keeps inspiring, challenging, broadening me as an actor and a person, and let’s be honest paying the bills; I am happy. I would love to work in TV and film as well as theatre, and hopefully on both sides of the Atlantic! Many thanks for this great interview, Dani and all the very best to you! At Guildhall, Mabel Purdie in Dear Brutus directed by Wyn Jones, The Waitress in Badenheim 1939 directed by Christian Burgess, Little Girl in Festen directed by Joseph Blatchley, Claire DeLoone in On the Town directed by Wendy Allnutt, Agave in Bacchai directed by Patsy Rodenburg, Margery Pinchwife in The Country Wife directed by Martin Connor & Yelena in Uncle Vanya directed by Christian Burgess. Also, Kola Kola Bird in Just So directed by Simon Sharp & Graham Hubbard (Edinburgh Fringe).